Size: 20.7 x 13.6 inches. Condition: Discolouration in margin. Dark impression. 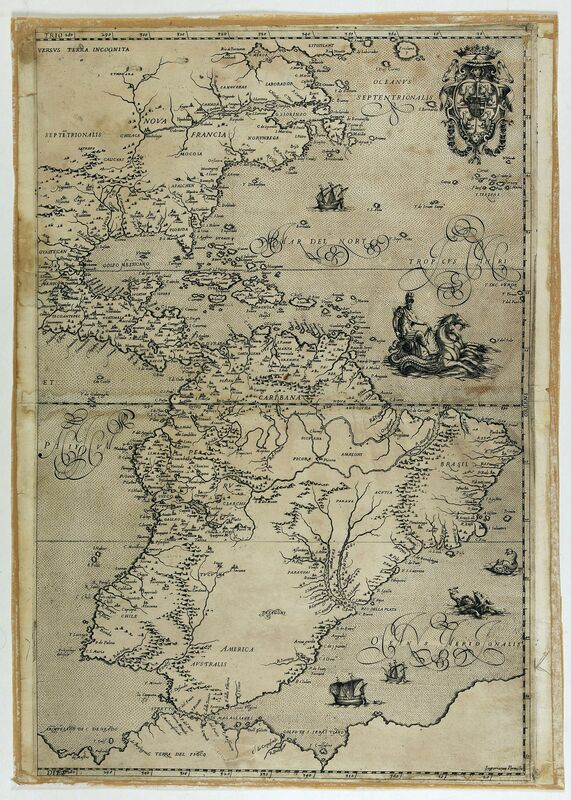 An engraved map, consisting of the right hand part of a two sheet map of the Americas. Fausto Rughesi, a native of Montepulicano, is best known as Roman architect, his major work being the façade of the Chiesa Nuova (Santa Maria in Vallicella), of 1605. His cartographic activity seems to be limited to five maps which he did in 1597 for Vicenzo Gonzaga, Duke of Mantua (1587-1612). In the upper right corner the Gonzaga arms. A later version exists but with the dedication and arms left blank. Their cartographic excellence is matched by the highly artistic execution, featuring beautiful Renaissance cartouches with title and text and sea monsters, ships, etc. enlivening the oceans. While no definite direct source to these maps can be established, it is evident that Rughesi used the most up-to-date information then available in the maps by Ortelius, Gastaldi, De Jode, etc., as well as in Portuguese portolans. Fausto Rughesi, a native of Montepulicano, is best known as Roman architect. His major work is the facade of the Chiesa Nuova (Santa Maria in Vallicella), of 1605. Rughesi was commissioned by Vicenzo Gonzaga, Duke of Mantua (1587-1612) to prepare a set of 5 maps maps (world and 4 continents) which he completed in 1597. The map of Asia exists in two states, this being the only known example of the second state of the map (which was previously unrecorded). The second state can be distinguished by the removal of the dedication cartouche and coat of arms, dedicating the map to the Duke of Mantua, who had promised to pay Rughesi 200 gold crowns. Apparently, based upon surviving correspondence from 1597 and early 1598 between Annibale Chiepo and Rughesi (recorded by Fiorini in his article on Rughesi's world map), it is known that the Duke failed to pay the second half of his promissed commission to Rughesi, almost certainly the cause for Rughesi's masking out the dedication and coats of arms of his patron, in order to offer the map at his own expense. Masking a portion of a plate involved placing a blank piece of paper over a part of the printing plate, in order to prevent that part of the plate from striking the paper and leaving a printed impression. The paper was placed on the plate after the plate was inked, resulting in the 2 blank ovals present in the map of Asia shown here. Rughesi's maps are unknown to most bibliographers because of their excessive rarity. Only one set of the maps has survived which is now in the Vatican Library. The Vatican copies, however, are badly damaged, whereas the present maps are, with the exception of some very minor and insignificant repairs, in excellent condition. The map is extremely rare with two examples known (Kraus collection in Texas University and Biblioteca Apostolica Vaticana, Vatican/Rome (in poor condition)/ The left hand sheet in a Privite collection and here the Right hand sheet) These are the only know examples. Almagia, Monumenta Cartograpbica Vaticana, II, pp. 69-71, plates 21-23. - See Fiorini. II Mappamondo di Fausto Rughesi (Extr. from Boll. Soc. Geog. Icaliana, Nov. 1891). - None of the maps in Nordenskioeld, Facs. Atlas, the Asia map not in Teleki, Atlas zur . . . Kartogr. der Japan, lnseln. Reference: Kraus 25.2, America, Burden, 108..